Our house is a chaotic place. We all come and go at different times of day and night. Boundaries between day and night are often stretched, with early-morning writing jags and lifts to choir offset by late-night walks with the dog or report card-writing sessions. I don't think this place has an off-button. We often use notes - handwritten, on paper, just like the old days - to connect with each other. While we all have smartphones, and we use them constantly to stay in touch and keep everyone on-schedule and in the right place at the right time (yes, I'll be there at 5:25 when you're finished work...) there's something, I don't know, substantial, about a slip of paper on the kitchen table. Or in this case, tucked up against a mug filled with steaming-hot goodness on an otherwise cold and dark morning. I love my life for a whole lot of reasons. 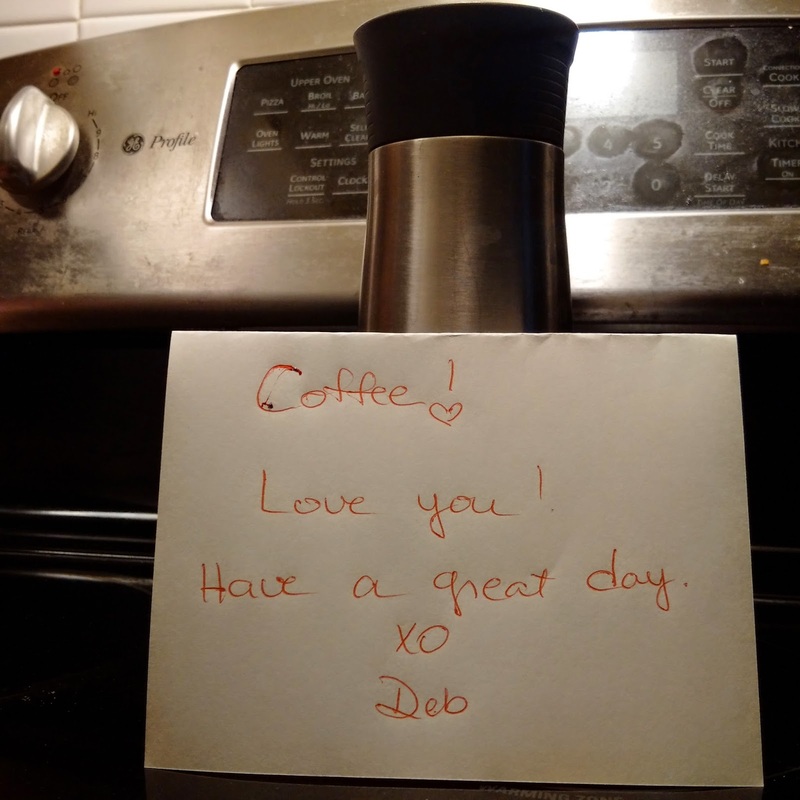 A simple note on a simple mug of coffee reinforces the why. And reminds me why I'm as lucky as I am. Your turn: Do you still write on paper? To whom? And why? I do still write on paper! Usually notes to myself or researching. I have many, many notebooks...everywhere. We use a chalkboard for passing messages though.